The single main terminal building is on five levels. The basement level houses the station for the airport express train and a connecting tunnel to the airport hotel. There's also a small food court just outside the train station. Level One is where you can catch a bus directly to the city, and also has a food court and convenience store. 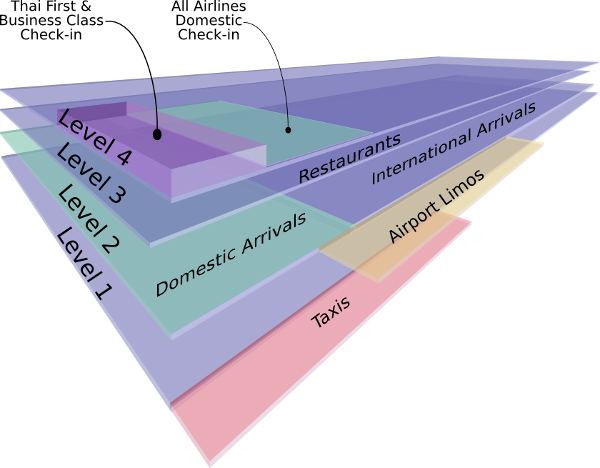 The second level is the main arrivals level. Baggage claim, customs, and all transportation services can be found on this floor. You'll also find several bank exchanges and ATMs here. The third level houses most of the restaurants and public access services, including a beauty parlor and massage service. The fourth level is the main check-in hall for all domestic and international flights. At the back of the hall are a few shops, including a bookstore and post office. Immigration is also at the back of the hall.